The Maserati GranTurismo S coupe looks great and sounds even better. It’s super-fast and has space for four. Interested in buying a Maserati Granturismo? The Maserati GranTurismo S makes a big impact. Combining look-at-me features including seven-spoke 20-inch alloys with spadefuls of style isn’t necessarily an easy act to pull off but the Maserati GranTurismo S does it. It also features chrome-trimmed side vents, red-painted Brembo brakes, oval section exhaust pipes you can fit an arm in, black headlights, new-design side skirts, boot-integrated rear spoiler and of course that gaping grille with the iconic Maserati badge. The class continues inside the car with electric assist on the doors giving that touch of luxury. Once behind the three-spoked steering wheel the first thing you notice is what’s missing, with ‘R’ and ‘1’ buttons instead of a conventional gear stick. The black fabric roof lining adds to the feeling this is very much a driver’s car of serious intent. The displays, dominated by a shift indicator, are clear and easy to read. Trident-embossed headrests look the part, too. The Maserati GranTurismo S is a two-door coupe with useable rear seats. The boot may require some thoughtful packing with just 260 litres available. The transaxle layout combines a front-mounted engine and rear-wheel drive with the weight distributed 47 per cent over the front axle and 53 per cent over the rear. It features the same suspension layout as the regular GranTurismo. However, vehicle roll has been reduced by ten per cent as a result of modified springs, bars and dampers. The car is certainly comfortable enough for long journeys, even over poor surfaces. Power comes from a 440hp 4.7-litre engine. This takes the car from 0-62mph in 4.9 seconds and on to a top speed of 183mph. Press the Sport button to open two valves fitted close to the rear silencers and generate what Maserati describes as “a distinctive resonance”, or what we would call “one helluva roar”. The Sport setting also increases available power output, accelerates shift speed and adjusts the dampers. The smooth six-speed automatic gearbox can be controlled by paddles integrated with the steering column. There are six possible gearbox settings to play with, accommodating a spectrum of driving needs. Car tax falls in the top bracket and ownership will get you on first name terms with petrol station staff. Official figures suggest you can expect around 17mpg. CO2 emissions are 387g/km. The automatic version of this car was launched in 2008 and no problems have come to light as yet. The finish is all you would expect from a car at this price and there is a strong sense of quality inside and out. 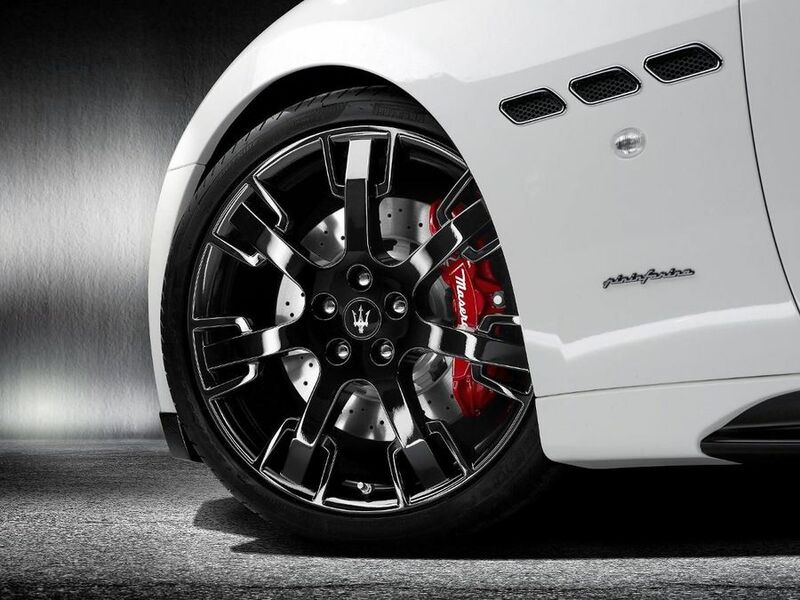 The Maserati Stability Programme is there to help keep you out of trouble, though it can be turned off for track action. Brembo brakes come as standard and there are six airbags. Standard equipment includes 20-inch alloy wheels, front fog lights, cruise control, dual-zone climate control, rear parking sensors, CD/radio with sat-nav, and a 30GB hard drive. Options include a variety of finishes. We love the engine noise but all in all it’s got to be looks. This is a car which says: “I like driving and I’ve got taste” (before being drowned out by the sound of its own engine).